Thiessen Farms – our new look! 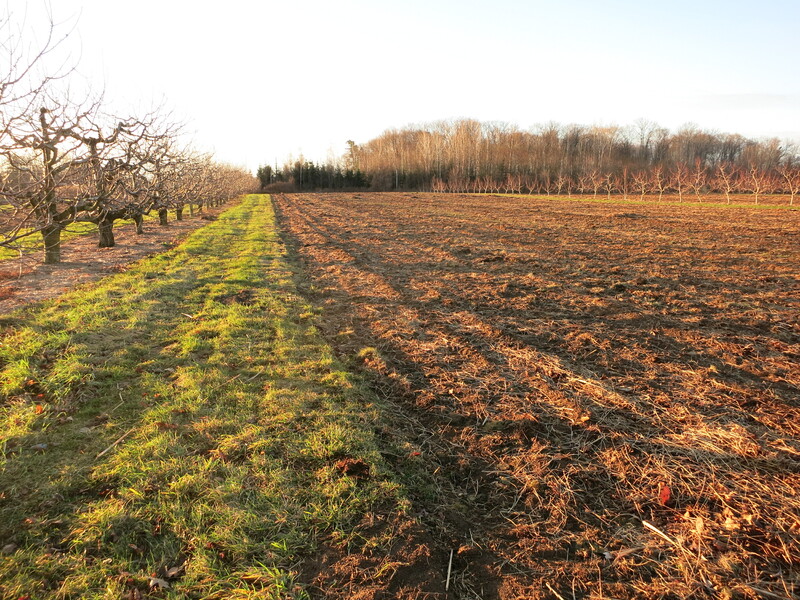 My father used to remind me to finish up the fall farm work and have the orchards “put to bed” for winter by the end of November – because freeze-up usually happened the first week of December. Any job not completed by then might have to wait until spring. Here we are in the 3rd week of December & it feels much like October. We have only had a few nights with frost all fall. The temperature almost reached 20 C last week! That’s great because we have had much to do on the farm this fall. It was a lot of work to cut down our fruit trees & clean them up & burn them (cherry, plum & pear branches were saved for firewood). Do you have any idea how many roots sweet cherry trees have?!! 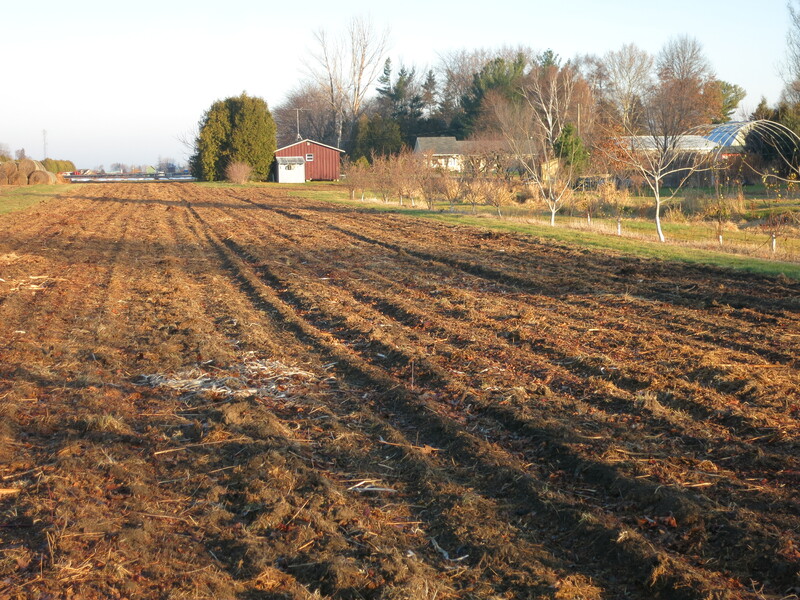 We cultivated the ground & picked up roots several times, then plowed the soil & picked up roots again. But I know we will still be finding roots for a few years. 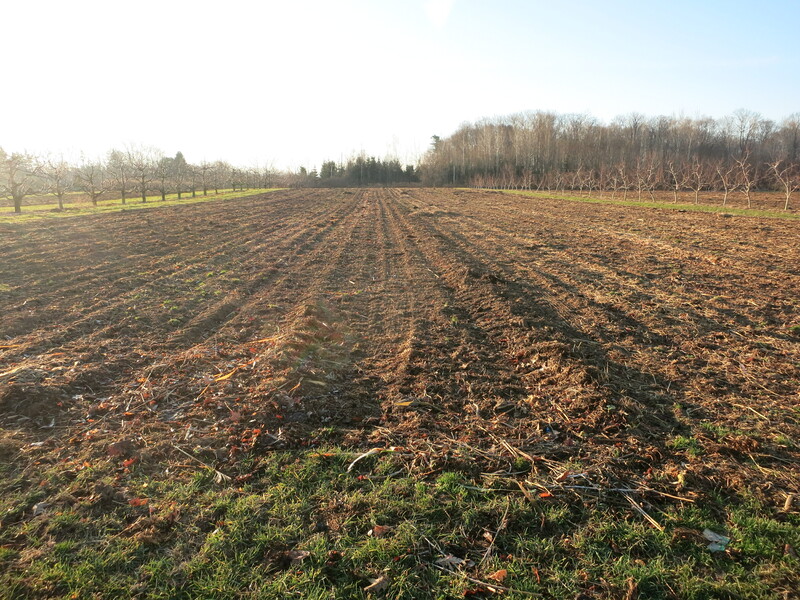 More cultivating & discing was necessary to get the ground level & smoothed so we can plant vegetables in spring. Then we spread manure & lightly worked it in. Finally a layer of leaves & grass clippings was spread over everything to try & cover the soil. We did all this on about half of the farm. We really don’t like leaving the soil exposed over the winter – the winter winds cause erosion & blow our soil to the neighbours. However by the time we were finished everything, it was too late to seed a cover crop to protect the soil through the winter. 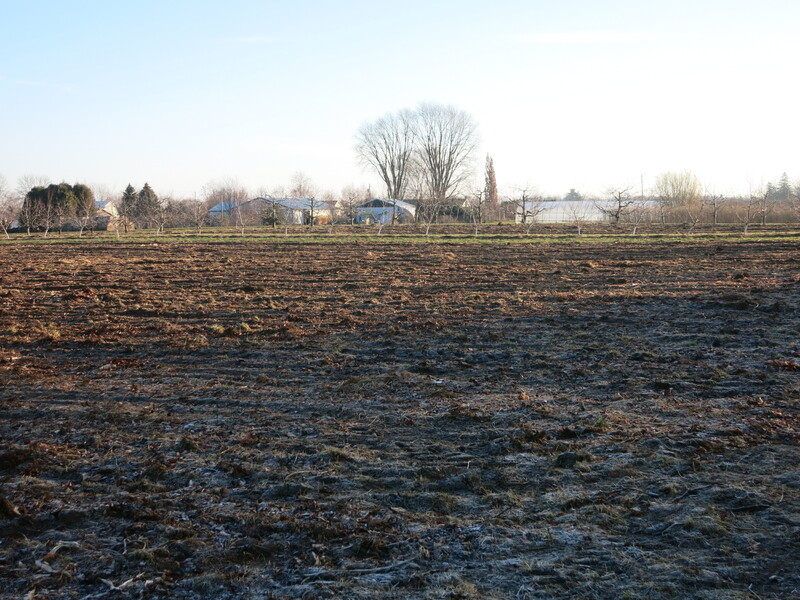 On the other part of the farm we only removed the trees – no cultivation or plowing. 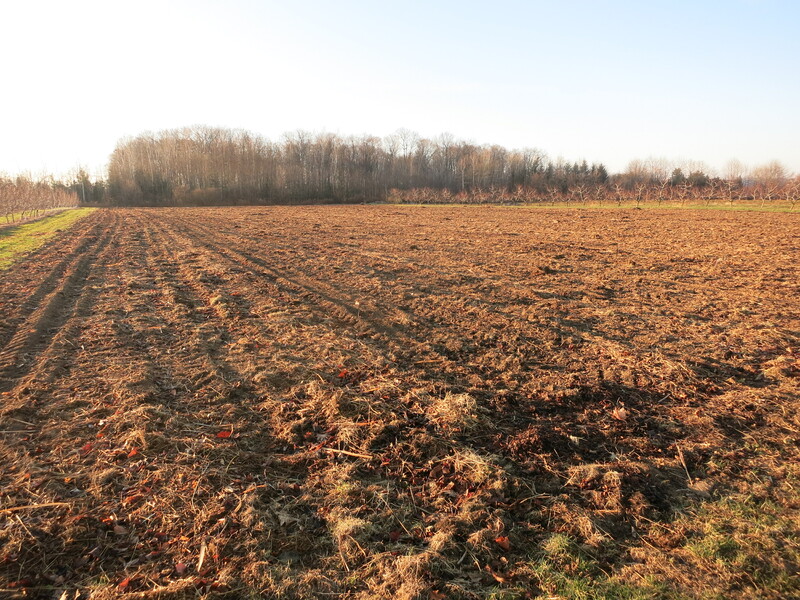 We won’t need this ground for early planting so we can prepare it in the spring. This allowed us to leave the grass & mulch that were already there from when it was orchard and will prevent soil erosion over the winter. 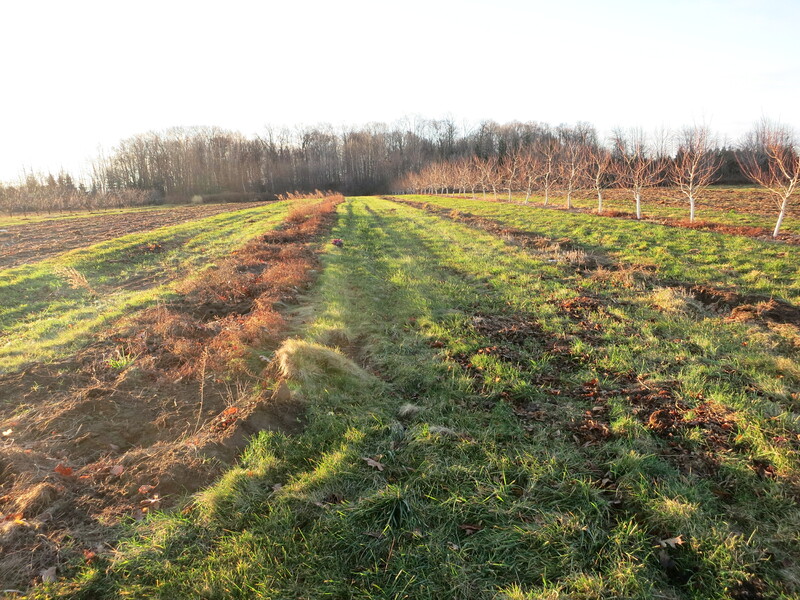 We left 4 rows of trees spaced throughout the farm. The purpose of these trees is to be windbreaks for the vegetables. These will be removed once better & more permanent windbreaks are established. Because I don’t intend to prune or spray these 4 rows, we probably cannot expect to harvest any quality fruit from them. 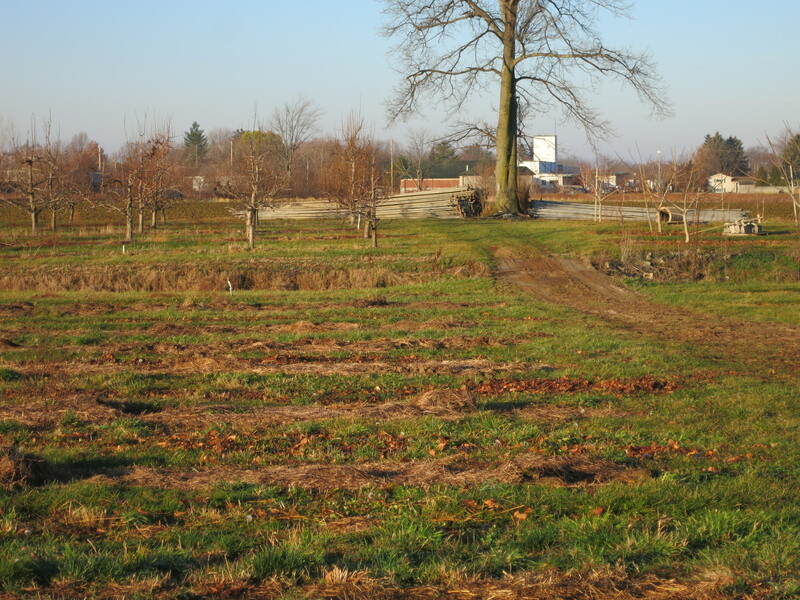 The farm looks totally different now from what it has looked like for the past 65 … years. It’s going to take some getting used to!